Awards: B.R.A.G. Medallion™ Honoree, 2017. In present day Washington, D.C., renowned digital photographer Maggie Thornhill discovers a mummified corpse in her basement. She believes it to be her ancestor, famed Civil War photographer Joseph Thornhill. The truth she uncovers, however, will change written history as we know it. 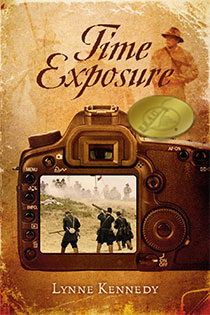 “Time Exposure provides strands of history well-woven with a compelling modern day story. Twists and turns throughout history end with a modern day whodunit. Terrific! “Intrigue spans a century – from the Civil War to modern day. Author Lynne Kennedy links Abraham Lincoln’s day to characters living and working in the 21st century. High-tech photo labs uncover scintillating connections that lead Maggie Thornhill on an amazing journey. Action, science and romance combine to provide a great read!